Should I Buy Gold Coins or Gold Bars? Compared to coins, gold bars offer lower acquisition cost, and smaller bars are a common solution for acquiring gold in an affordable way. 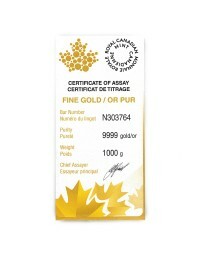 Every bar is tested to be 99.99% pure gold and a full one troy ounce. 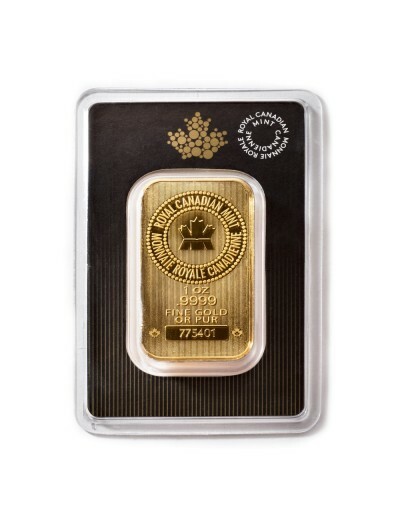 The size of these 1-ounce gold bars makes them easily transportable, stackable, and storable. 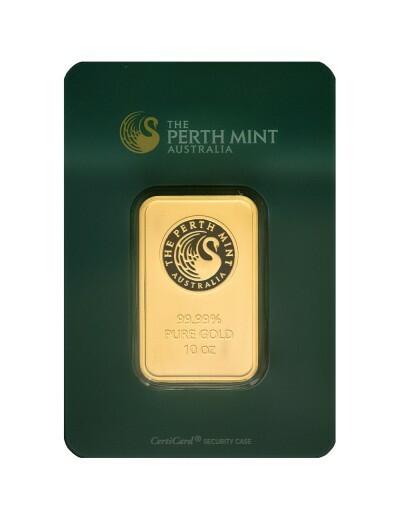 What are Current Gold Bar Prices? Although precious metal products prices fluctuate with the commodities market every 20 seconds, it is independent from the stock market and other money markets; nevertheless, stock market shifts, inflation, and elevated recession indicators can affect gold prices. Federal monetary policy and the global economic climate affect gold prices the most but elections and geopolitical volatility periodically influence precious metal price fluctuations, as well. 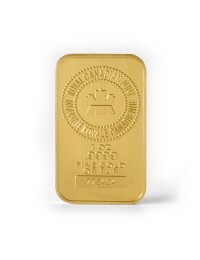 Is It Safe to Buy Gold Bars Online? We are a subsidiary of Kaspar Companies, a South Texas company that has been continuously operating since 1898. TPM has processed more than half a billion dollars in client transactions since 2011. These transactions represent more than 42,000 orders to all 50 states. We have sold more than 300,000 troy ounces of gold (9.3 metric tons) and 10 million ounces of silver (311 metric tons). 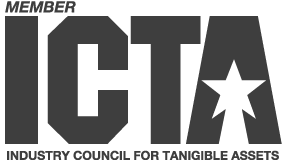 In 2014, TPM was recognized as the No. 1 “fastest growing Aggie-owned or Aggie-led business in the world” by Texas A&M University. Since 2015, we have been the No. 1 seller of precious metals coins on Amazon.com. In 2015, Inc. Magazine named TPM the No. 200 Fastest Growing Private Company in America. 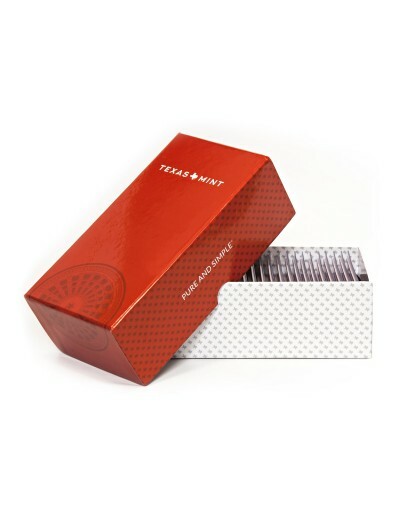 We open sealed monster boxes or coin tubes only to fill orders of uneven increments. Many mints now include security features on their metal; for example, all Sunshine Mint brand bullion products have a micro-engraving that is only visible by placing the Mint Mark SI™ decoding lens over the security pad. All packing operations are videotaped. If a rare mistake is made, we will review our video logs. We will happily and promptly correct any shipping mistakes. If a package is lost or stolen in transit, we will file a claim and issue you a new package. For security reasons, we restrict clients from contacting UPS to change delivery instructions. We will not ship to mail forwarding companies, PO Boxes, APOs/FPOs, or US territories. We do not employ salespeople at our company, and there are no commissions or sales pitches. Our staff exists for only one purpose: to facilitate a low cost, friendly, and efficient purchase. What Are the Sizes and Weights of Gold Bars? 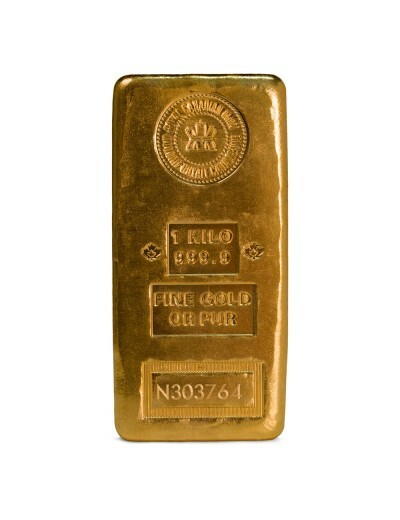 The sizes and weights of gold bars typically range from 1 gram to 10 oz. Texas Precious Metals offers 1 oz. and 10 oz. 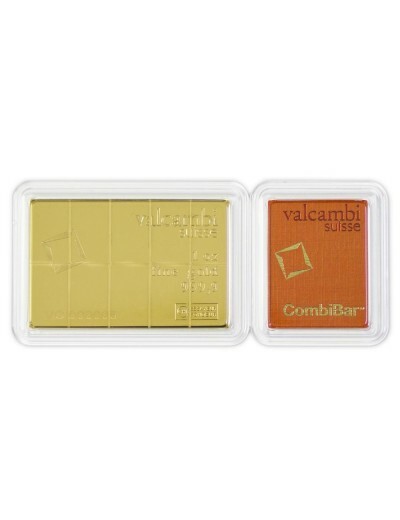 gold bars in a variety of shapes and conditions from diverse mints, notably the Valcambi Suisse CombiBar produced by Valcambi in Switzerland and the 1 oz. 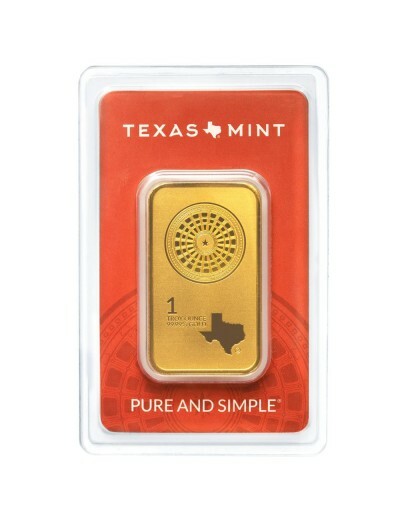 Texas Mint Gold Bar. 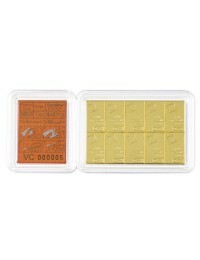 Gold Bars sold by Texas Precious Metals are superior because they are made of .999 or better pure, fine gold, guaranteed, and are beautifully crafted with finely-detailed designs on both sides. We are one of the largest precious metals companies in the United States and we offer private storage at our underground Class 2 depository, Texas Precious Metals Depository, which is 100% fully insured by Lloyd’s of London. Finally, our mission is to provide value to customers through stellar, devoted customer service, low premiums, superior products, and easy ordering. Pure and simple. The Texas Mint is the refining operation arm of Texas Precious Metals. In 2017, Texas Precious Metals spun off the Texas Mint as its own division with the purpose of expanding the product line and distributing these products to other national dealers. 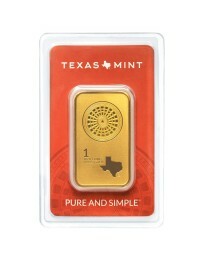 The Texas State Capitol is the theme for all of these products, which include one ounce gold rounds, one ounce silver bars, ten ounce silver bars, one hundred ounce silver bars, and the popular one ounce Texas Silver Round. The current Texas State Capitol in Austin took eight years and over 1,000 people to build. Finished in 1888, the Texas Sunset Red granite structure in the Italian Renaissance Revival architectural style was topped off with a 16-foot tall zinc statue of the Goddess of Liberty, the inspiration for the Statue of Liberty imagery used throughout the United States. A-Mark Precious Metals, Inc.(NASDAQ:AMRK), (“A-Mark”), a full-service precious metals trading company and an official distributor for all the major sovereign mints, is the exclusive distributor for the Texas Mint, a division of Texas Precious Metals. 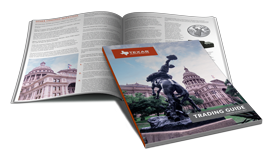 The catalog of Texas Mint products, including gold and silver rounds and bars, is sourced, manufactured, and distributed through A-Mark’s vertically integrated subsidiary businesses. Purity is calculated as the precious metal weight divided by the total weight. In the case of a .9999 fine, the gold content is at least 99.99% of the total weight. Common sovereign coins that are only 22k (91.67%) are generally referred to as “bullion,” even though they do not pass the technical definition, since they are purchased primarily for their metallic content and not for collectible purposes. A fascination with gold can be traced back for thousands of years, and it has been referenced numerous times through many ancient documents, including the Bible. The United States adopted gold as the official standard of value in 1879, but in 1933, during the Great Depression and just 54 years after adoption, FDR abandoned the gold standard. Gold is element 79 and its symbol is Au. ca 3,000 B.C. : Egyptians developed the first known currency exchange ratio. 1799: First U.S. gold rush; 12-year old Conrad Reed discovered a seventeen-pound gold nugget in Meadow Creek in Cabarrus County, North Carolina. “In contrast to political money, gold is honest money that survived the ages and will live on long after the political fiats of today have gone the way of all paper.” — Hans F. Sennholz. Where is Gold Found Today? The average human body contains about 0.2 milligrams of gold, some of it in our hair but most of it is in our blood. There are approximately 190,000 tons of gold above ground worth more than US $7.6 trillion. Mine production adds approximately 2,900 tons per year, equivalent to an annual 1.6% increase, but there are still approximately 52,000 tons of minable gold in the ground worth US $2 trillion. Gold has been the most coveted precious metal in the world since antiquity, for it is relatively scarce and impossible to create without nuclear reactions and prohibitive expense; it is also easily identifiable, malleable, and untarnishable. These properties make gold a preferred monetary metal and have ensured its place as a symbol of wealth and power, as well as a guarantee for the value of currencies, for centuries. Gold’s stable purchasing power and durable value makes it a strategic asset in a diversified investment portfolio. Many investors are drawn to gold's role as a hedge against systemic risk, inflation, and volatile stock market fluctuations. Historically, gold has improved the risk-adjusted returns of portfolios, reducing losses, and provided liquidity to meet liabilities in times of market stress. Gold is not only useful in periods of higher uncertainty or economic downturn. Scarcity has ensured that gold's long-term returns have been comparable to stocks and higher than bonds or commodities; in fact, its price has increased by an average of 10% per year since 1971, when gold began to be freely traded following the collapse of the Bretton Woods agreement. What are the Options for Buying Gold? When you want to buy gold, you have the option to buy gold bars, gold jewelry, gold rounds, or gold coins from sovereign mints and/or precious metal refineries. Gold is extremely rare; a miner is more likely to find a five carat diamond than a one-ounce nugget of gold. Even mining all of the oceans in the world would yield only 10 parts of gold per quadrillion though they are estimated to hold up to 15,000 tons of gold. Buying gold is a whole lot easier than finding gold. 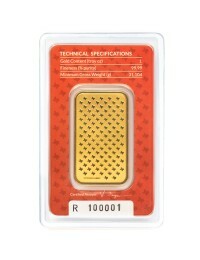 Generally, non-legal tender gold bars are cheaper than legal tender coins by a few dollars per ounce. Clients seeking to purchase gold for the least possible price favor gold bars. The larger the bar, the lower the premium per ounce. 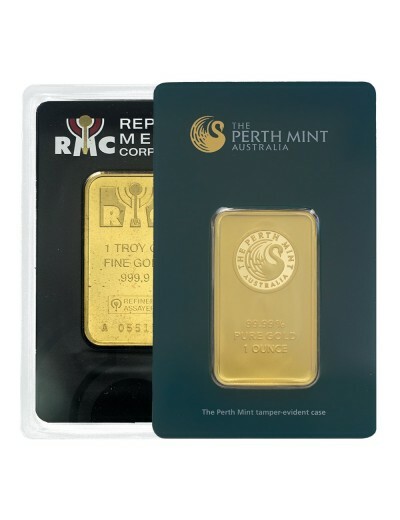 Gold bars issued from government mints are IRA eligible. The downside is that the IRS requires precious metals dealers to file a 1099-B form when repurchasing gold bars in increments exceeding 32 ounces per transaction. Around half of all gold mined today (49%) is made into jewelry, which remains the single largest use for gold. For those who have decided to purchase gold bars, there are several factors to consider when making your purchase. For example, from which mint should you buy your gold? 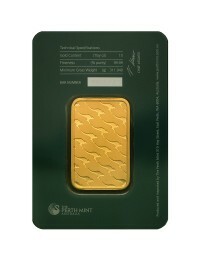 The price for each ounce of bullion consists of the metal’s spot price and the bullion premium. The spot price of gold is the price of one ounce of gold as contained within a 400-ounce gold bank bar traded on the commodities exchange at current market prices. The bullion premium is the additional charge for a bullion product over its current spot price. The premium for precious metals gold bars is also calculated based upon minting and shipping costs. Buyers cannot afford (or do not want) 400-ounce gold bank bars; they want smaller denominations. Smaller denominations must be minted.